Since my time at the River of Life Church​, I have come to learn a lot of about prayer and really touching God through this communion with Him. We pray and make our needs known before God, and I asked in my spirit, where do blessings come from (more specifically…financial blessings since there’s no money in heaven). I know they come from God, but what or who is the catalyst? God answered my question at the funeral of my dear grannie, Ella Taylor. As part of the service, Pastor Steve Thomas (Otis Road Church of God, Jax, FL) spoke of her fondly. He said grannie called him after having not spoken to her in about two years. When he answered her call, she said, “Brother Steve, are you ok? God called your name out in prayer today. Do you need anything? Do you need any money?” And THERE was my answer. But first, a little history. See, my grannie was a prayer warrior. When you see that label, you may think of someone who regularly spends time in the alter in prayer, and while there are people who do have an intense prayer life that reaches God, that wasn’t my grannie’s way. Grannie prayed or was in a spirit of prayer 24/7. You think I’m kidding?? Ask ANYONE who knew her. I spent the night with her once for several days, and we fell asleep listening to 1 John on cassette tape (that will date the event). She wakes up with thanks and praise on her lips, and she went about her day as a homemaker with the bible playing on tape, or Christian music playing, or maybe total silence with her bible open on the kitchen table (marked up and falling apart), and if you walked in the house without her hearing you, you would hear her talking to God with spontaneous instances of praying in tongues, shouting, and she might even laugh and dance a holy jig of excitement at whatever the Holy Spirit had revealed to her. Her life was not NORMAL. She was a “be ye separate” in the truest interpretation of that scripture. She would grocery shop, but beyond that, she only left her home to go to church, which she attended every single service. My grannie did not care what anyone thought of her. Honestly, I don’t think it EVER really crossed her mind, but if I were to ask, “Grannie, don’t you think people think your crazy,” she would have said, “Darling, God is not mocked. Let them think I’m crazy. I’ll be crazy for Jesus… (shouting with excitement wooo, wooo, wooo then something uttered in tongues). Her relationship with God was made even more intimate with her commitment to fasting (especially after the death of my papa in 2001). I am 43 years old, and my grannie has fasted MY ENTIRE LIFE. I’m not talking about turning off the t.v. for a day. I’m not talking about avoiding cake or just not drinking coffee. I’m talking about full day fasting–complete–no food–fasting. After 2001, her weekly fasting (which was usually on Monday–it was how God called her to fast, the Holy Spirit would speak to her and say, “I call a Monday” which meant, he was calling her to fast) turned into multi-day fasting. I don’t know if any of us know how many days see would actually fast toward the end. She may have confided in someone about it, but she was private about it unless something we wanted to do would interfere with her fast, then she would tell us she would be fasting, so our plans could be changed. The point is that my grannie was a SERIOUS PRAYER WARRIOR. A much coveted member of her church. She was valued by many. If you had a need, Sis. Ella Taylor was the person to call. The power of her pray was made evident by Pastor Steve Thomas when he explained that no one had told her anything about him having a need. During her time in prayer, the Holy Spirit spoke his name. What is even more important than he spoke her name is that SHE ACTED and called him. “Brother Steve, is everything ok? Do you need anything? Do you need money?” In times when you were most desperate, wouldn’t you want to receive that call? That is God in flesh–as close as he can be–answering our prayer. So, I will wrap up my post by driving this home, will the prayer warrior die? My grannie is at the feet of Jesus. She’s not here to touch heaven for me or Pastor Steve or Brother Larry Hall​, so who will? No one can take her place. God designed her to be unique. There’s not another one like her, but you can be God’s design of YOU. I can be God’s design of ME. I want my prayers to be effective. I want to reach heaven for me, my family, my friends, all those who I offer prayer for…so what do I do? How do I reach that level. I (we) can take lessons from her life. Keeping in mind my grannie was 87 when she passed away, so there were YEARS of growth there. She didn’t start at 14 years old with such efficiency, but she constantly grew. This means that we need to always been in a state of growth. To grow we need nutrition, which comes from the Word. Reading it, studying it, pondering it, sharing it, praying it, APPLYING it. Our walk will show our level of comprehension and obedience. If you didn’t know my grannie and was around her for even 1 hour (maybe even less), when you walk away you would have felt the presence of God (even if you didn’t know what that was). You would have thought, wow, I have no idea what I just experienced, but there is something very powerful about it. I want that level! I’m so hungry for that level! So it starts with submission. I want to grow, so I submit to the authority of scripture. I learn. I allow the Holy Spirit to grow the Word in me and through me. I increase its effectiveness through fasting (starting with a meal and increasing as the Holy Spirit strengthens me). I remain obedient to the Word and the bidding of the Holy Spirit. I remain in a spirit of prayer and take time to be in intentional prayer. 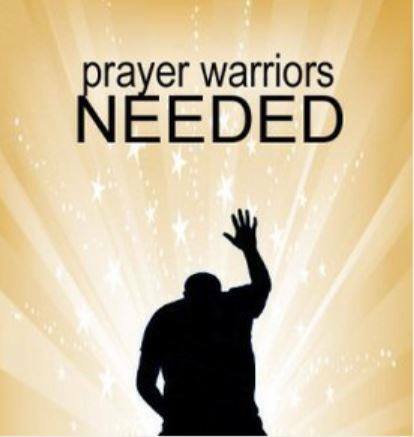 PRAYER WARRIORS NEEDED. Pastor Steve Thomas will never get that same phone call again. Not from my grannie at least. Will he or you get a phone call from someone else that God speaks through?? As prayer warriors continue to leave our world, we must be EVER diligent to take our place in the prayer circle for the healing and blessing of our families and friends. What is God revealing to you in response to this post?? Take time to pray and allow God to show you how to begin growing your prayer effectiveness.